Andrew Drasch was born and raised outside of Milwaukee, Wisconsin. When he was ten, Andrew and his father began making annual fishing trips north to Eagle River, Wisconsin. Now, Andrew makes his annual fishing trips to his cabin near the Menominee River. After spending the summer of 2002 in Alaska with the National Outdoor Leadership School (NOLS), Andrew knew he wanted to make a living outdoors. In 2005, he moved to Wyoming. It was here that he truly began to take fly fishing seriously. He got an opportunity to begin guiding and has been on the oars ever since. Andrew’s knowledge of the local Green and New Fork Rivers ensures that his returning clients and new clients alike will have a great day on the water. In the off-season, Andrew can be found floating the rivers of Northern Wisconsin fly fishing for Musky and building his knowledge of that region’s fisheries for off-season guiding in the future. 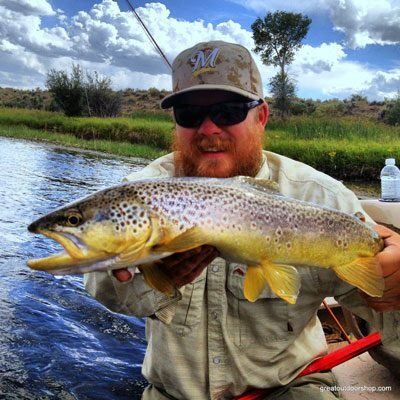 Andrew holds a diploma from National Outdoor Leadership School, a certificate of completion from Sweetwater Travel Company Fly Fishing Guide School, and is First Aid and CPR Certified. His top priority is safety on the water and to have a great trip. Oh, and to catch some fish.